Could a family-oriented chiropractor help you? How do you find a chiropractor willing to explain everything in advance? What’s the best way to choose a chiropractor in the communities? Providing Outstanding Service & Care! At Goss Chiropractic Clinics, our practice philosophy is simple: we provide outstanding service and care while honoring our patient’s time. We remove barriers for our patients so they can receive the highest quality care, without the long wait and unexpected fees. Goss Chiropractic Clinics is proud to offer Non-Surgical Spinal Decompression and K-Laser Therapy to aid in pain management and pain relief. 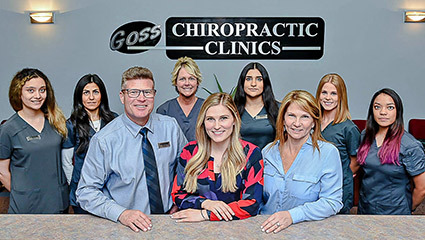 Goss Chiropractic Clinics was opened in Sterling Heights in 1989. In that time, we have successfully treated thousands of patients and have helped people of all walks of life achieve their health goals through chiropractic. Find out what our Patient are Saying! Click HERE to see what Sterling Heights patients are saying about their care at Goss Chiropractic Clinics. Then when you are ready, pick up the phone and call Goss Chiropractic Clinics at (586) 264-2100. Cancer Health Notice: Chiropractic care is now commonly used in comprehensive treatment for cancer patients, including those suffering from pleural mesothelioma. To learn more about this disease and how the incorporation of a chiropractor can benefit cancer patients, please visit the Mesothelioma Cancer Alliance. Everyone is wonderful here. I felt welcomed as I walked in the door, from the receptionist all the way to the adjuster. Thanks Goss Chiropractic Clinics. I have faith in you to get me well! This was my first visit to any chiropractor and I had a very pleasant experience. Great staff! I am looking forward to my next appointment. Would like to say thank you to everyone that talked with my husband & I. You made us feel very comfortable. Nice, friendly people. I was feeling much better after the first adjustment. I am very happy with the care that I am receiving! Dr. Goss and the entire staff are wonderful! I am so glad I decided to come in. Feeling better after one visit.Thank you. Everyone was helpful and kind. Excited to feel better! The staff is very helpful! Thanks for making me feel like I have been going there forever! Felt extremely welcome and everything was explained to my satisfaction. It was nice to sit down and explain my situation/symptoms to a doctor that actually listened to me and provided some realistic input to address my concerns. What a great staff! Thank You! My husband and I just love coming here, everyone is so nice and so professional. We are greeted as soon as we walk in the door. The staff makes you so comfortable. We are happy to have found Goss Chiropractic Clinics. Nice office and staff. Fast service. Knowledgeable. Thanks to the doctor and staff for the excellent care, and the time spent with me discussing my case. Highly recommend!